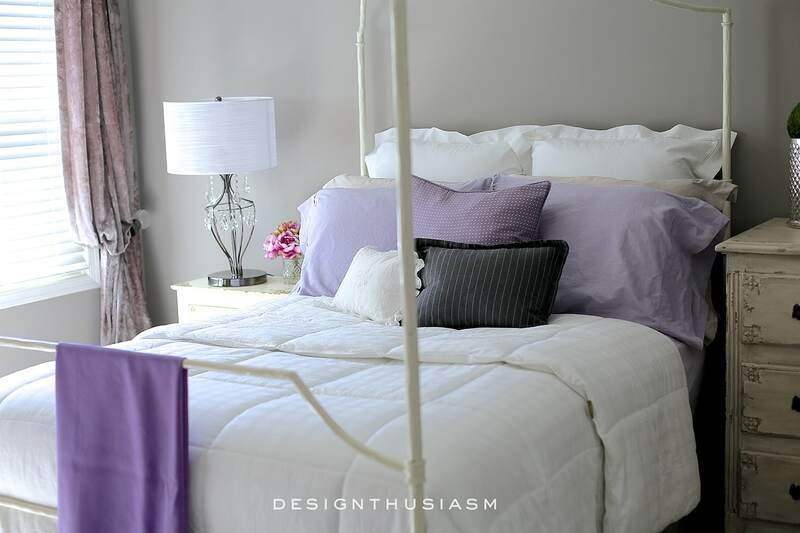 In this post: The goal for this secondary bedroom was a sophisticated but feminine look. 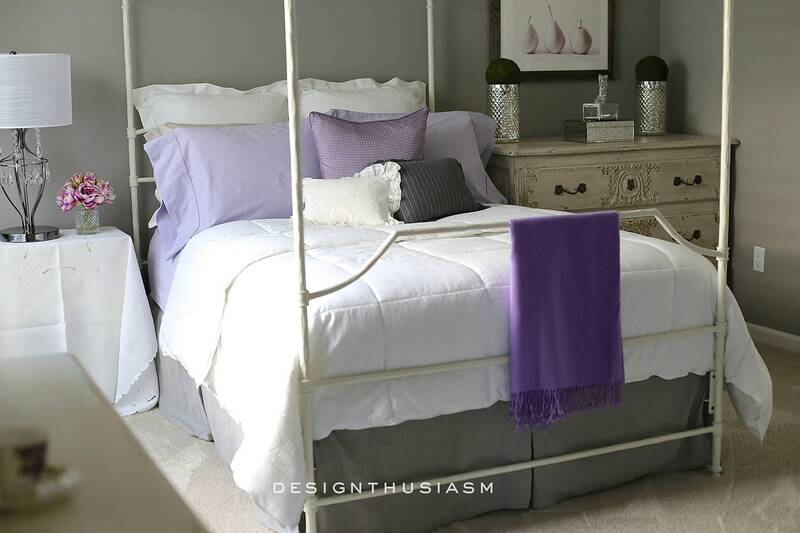 Inspired by many grey bedroom ideas, I settled on lilac accents. 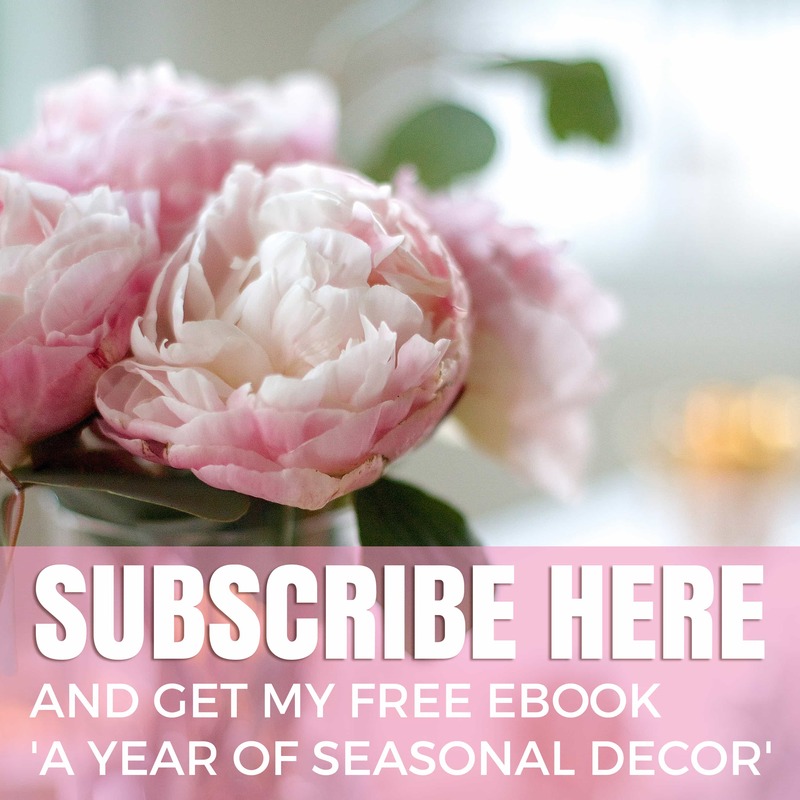 While I really enjoy design updates, seasonal decor, and styling vignettes, there are still several rooms in our new home I haven’t shown at all. 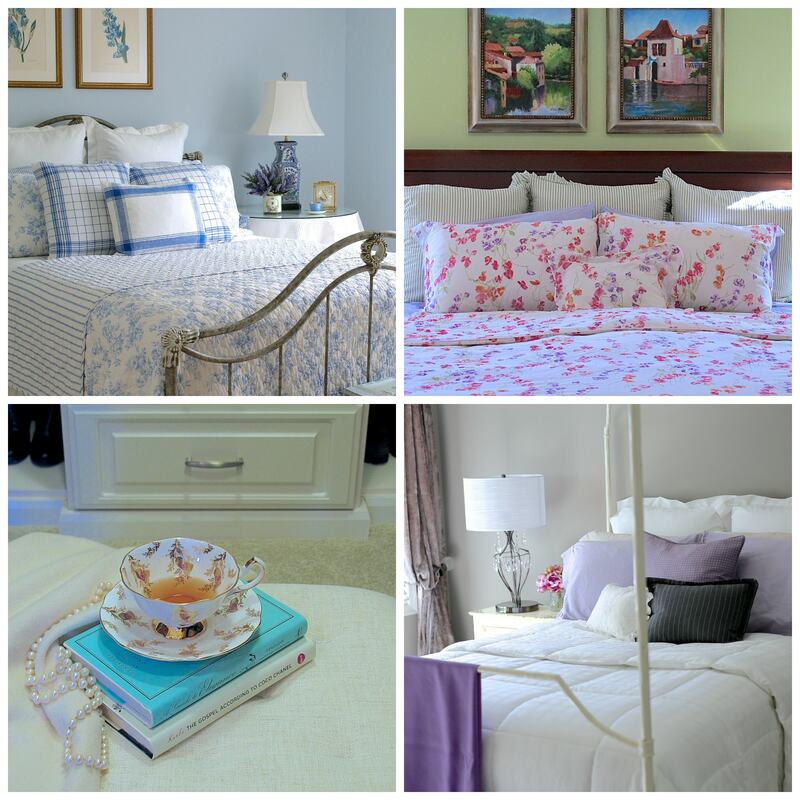 One of those is the lilac and grey bedroom that serves as my adult daughter’s room when she’s staying at the house. If you’ve been reading for a while, you may recall the mood board I did for this room, way back when we hadn’t even moved yet. Here’s a glimpse of it so you can see how the finished product relates to the plan. It was exactly a year ago that I posted the concept for this room, touting the mix of menswear patterns with feminine frills. If you’re interested in seeing the process and where this bedroom evolved from, you can visit that post, Mixing Menswear and French Frills in a Bedroom. And when you’re ready for the reveal… scroll ahead. The one thing we started with in this room, which is quite different than the rest of our house, is darker walls. My daughter is in her 20’s and hence this room is decidedly younger than most of our home. She had just graduated college when we moved in and was living with us for a few months. I wanted her to feel comfortable with the design, so that once she moved out, she would continue to see this as her room when she came back to visit. 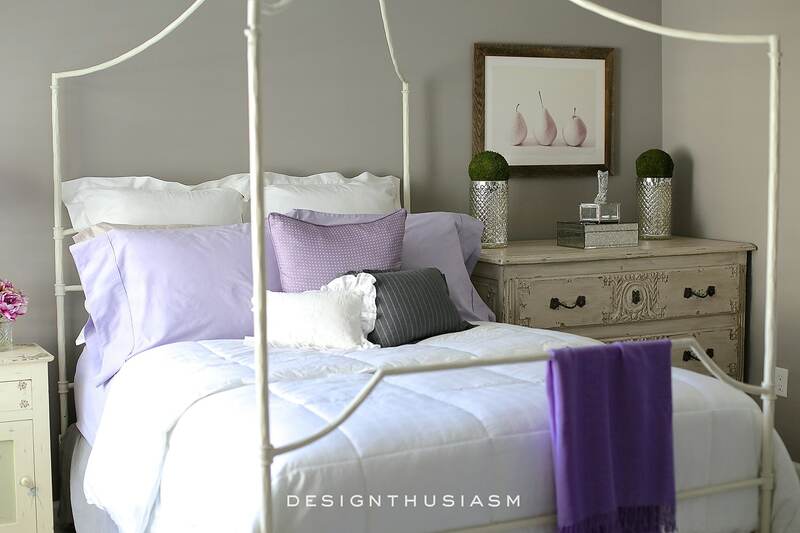 We experimented with several grey bedroom ideas and began with a palette of warm greys and beiges and chose lilac as the accent color. We kept my daughter’s bed frame from the old house, but bought several new pieces to update her room. This wonderful painted dresser was part of our original plan, and we were delighted with how it worked with the room once it was delivered. 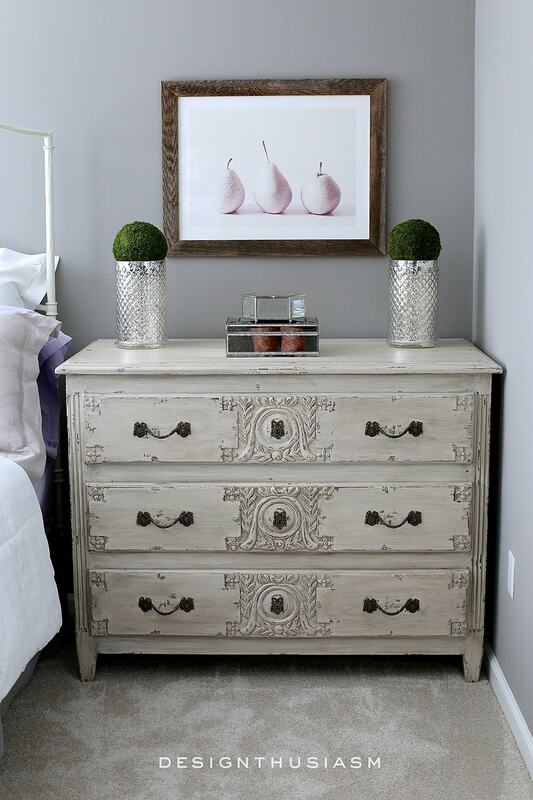 Above the dresser is a fabulous art print from Minted.com which really embodies the look we were going for – both young and fresh, yet also soft and romantic. I was provided with the artwork from Minted for this post, and as soon as I perused their website, I knew I had to have this piece, called Three Little Pears. Instead of my usual gilding we went with more silvery tones in the accessories. 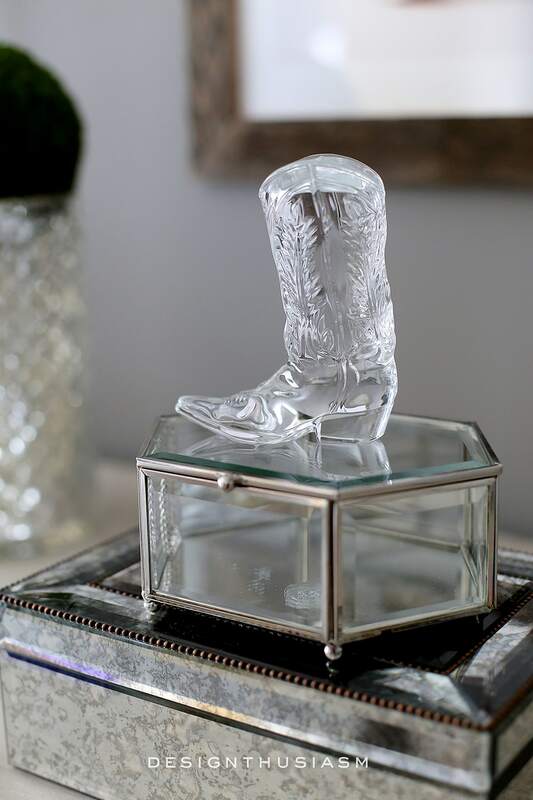 The mirrored and glass boxes and the mercury glass vases add a pretty luster to the space, while the crystal boot is a particularly meaningful touch for my daughter. The bedding is mostly from Ralph Lauren and the mix of patterns in the pillows embodies the essence of what we were trying to achieve. 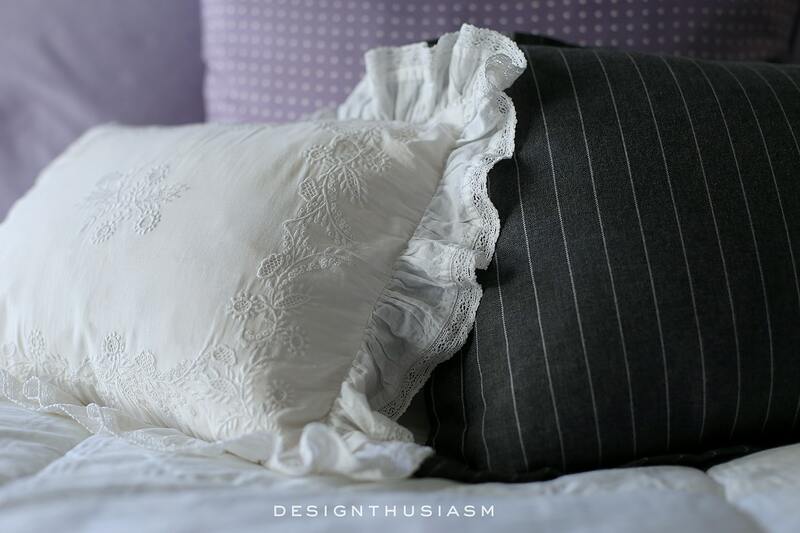 I love the way the mens-y pinstripe contrasts with the white embroidered pillow, and the lilac silk pin dot pillow punctuates the mix as a men’s tie would with a suit. 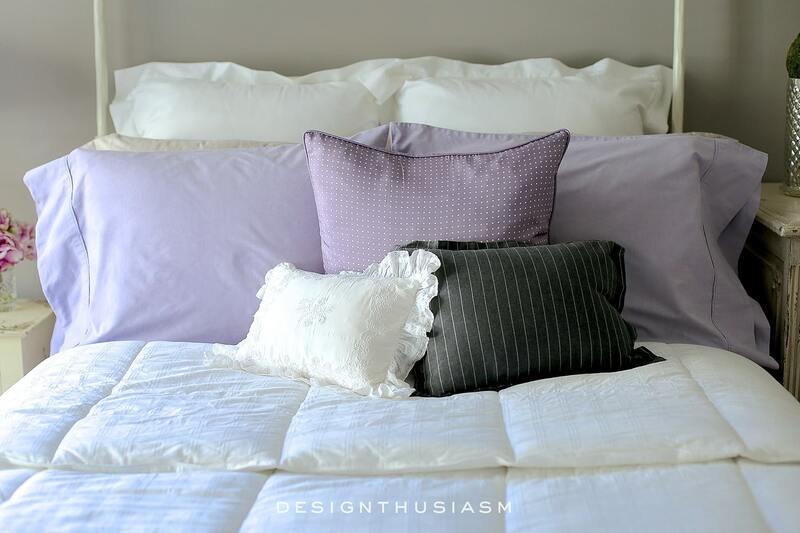 The lilac oxford sheets and pillowcases, as well as the pinstripe and pin dot pillows are from Ralph Lauren’s Haberdashery Collection. The sateen shams are RL Vintage Silver and the white pique shams are the Hemstitch Bloom Euro Sham. 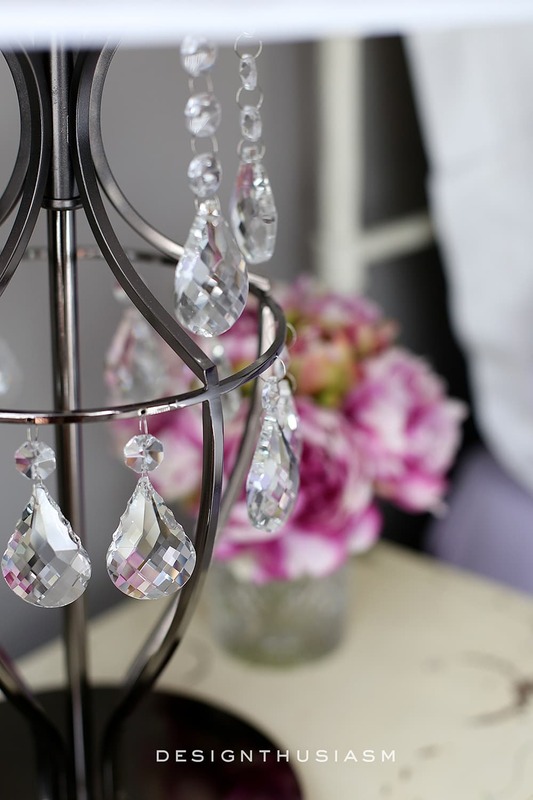 On the nightstand is a fun table lamp with a drum shade and crystal drops for a bit of glimmer. This petite painted desk used to be my desk in my old office but it fit well here (and left me open to get this gorgeous French Desk for the study). We added this fun grey storage ottoman with nailhead trim as a comfortable place to sit that would not block the view into the room. The mirror will eventually be replaced with something a little more interesting. Here’s a similar white desk. My daughter is a bit of a tea fanatic, which works well with my teacup obsession. And no room is complete without a few candles thrown in for good measure. The dusty lilac drapes actually came with the house and the big double window lets a generous amount of light into the dark-walled space. A mirrored lingerie chest is on the opposite wall from the bed, another new piece from our original mood board. 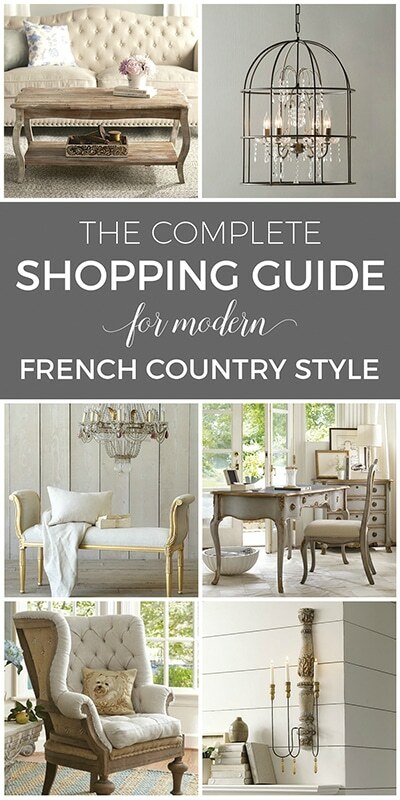 Ours was purchased at Soft Surroundings, but if they are out of stock, you can find a similar one HERE. 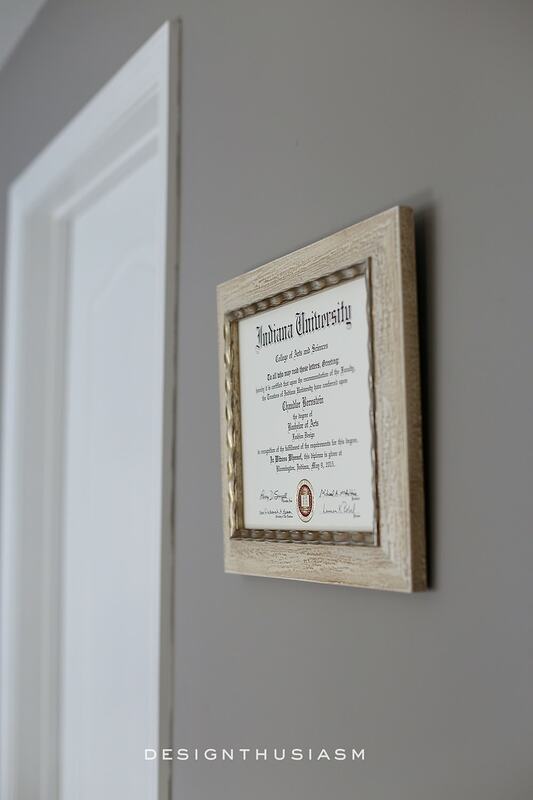 I selected a non traditional distressed wood frame for my daughter’s degree, which we proudly display in her room. There’s still more to do in this room but it’s finally starting to feel more finished than not. Coming soon, I’ll be posting my daughter’s new room in her first apartment, but that’s for another day. You are so classy. I love this room- what a great mix of elements. I love those crushed velvet drapes and the mix of menswear fabric with the white embroidered pillow. 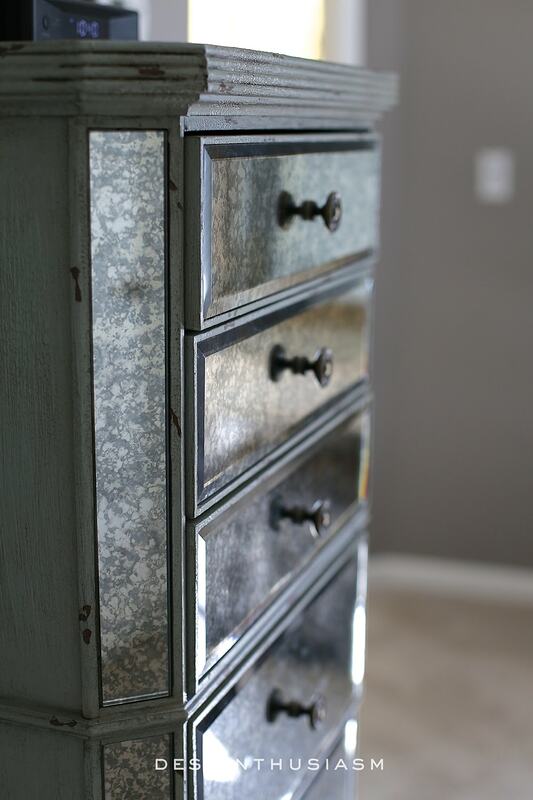 I adore that painted dresser- it’s done so well and the pear print above. Thank you so much, Liz!! Your comment made my day… 🙂 I was afraid the room didn’t photograph the way it looks in person and your words made me feel so much better about the post. We really lucked out with those drapes. The funny thing is, the room looked so different before, yet the drapes work perfectly! Thanks, as always, for visiting!! A beautiful room! I love the color palette. 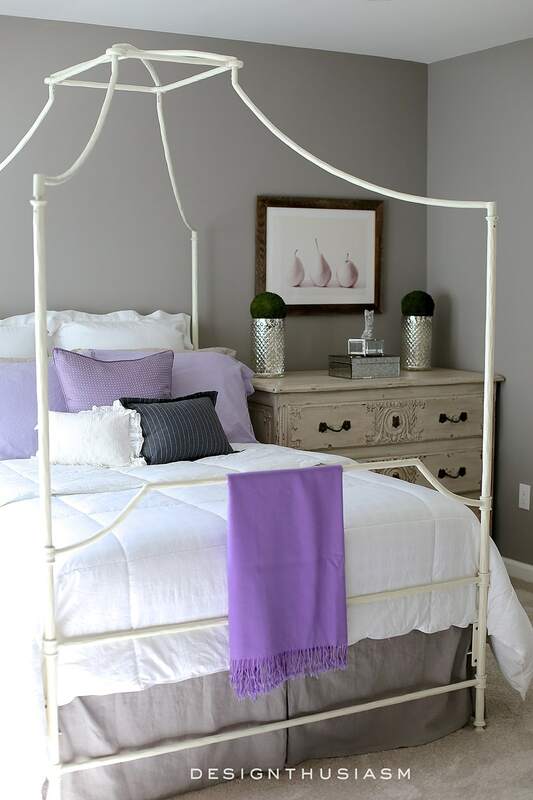 I also love the mirrored lingerie chest, painted chest, and the canopy bed!! 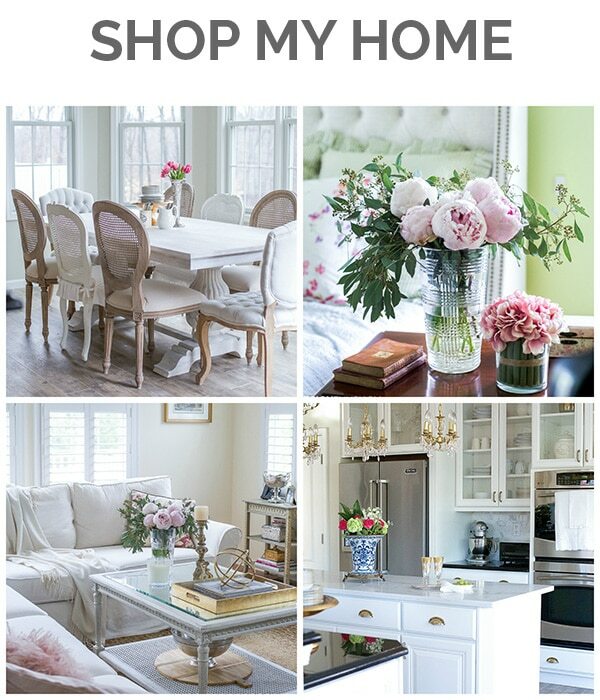 She should love this room as it is such a relaxing room to come home to! 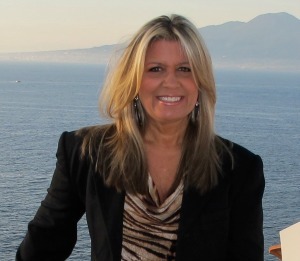 So pretty, Lori. 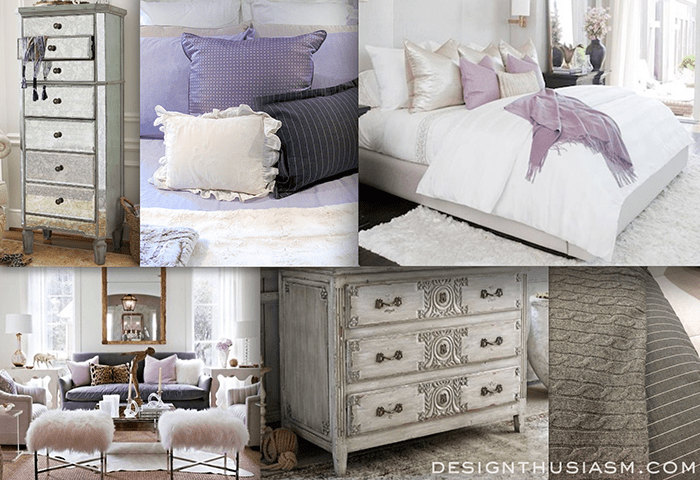 Loving the mix of gray and lilac and then feminine and masculine. 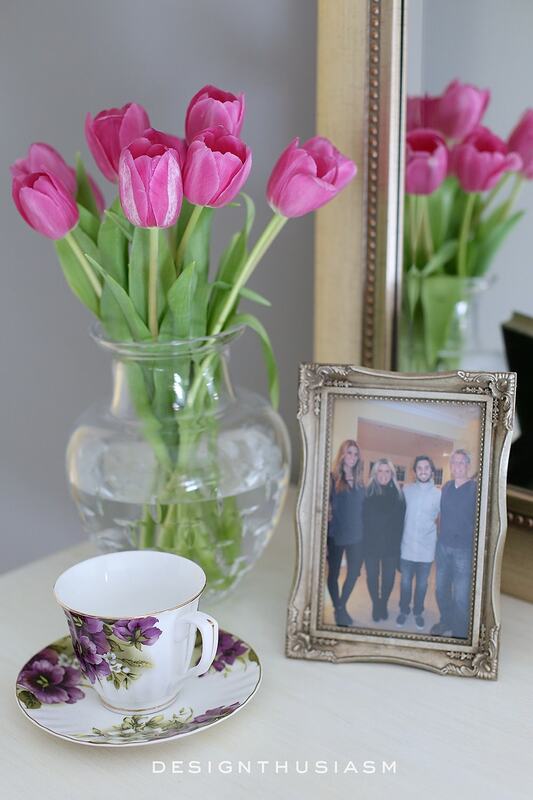 Lovely Lovely room Lory, I am sure your daughter must be thrilled with it. It is a very warm and inviting room. Oh, I’m lovin’ this room! The colors are feminine as well as grownup. I love lilac but it can be too girly or too matronly. You hit just the right color combo for a very welcoming room. I spotted her IU diploma…that’s a beautiful campus. As always you have put together such a beautiful room. 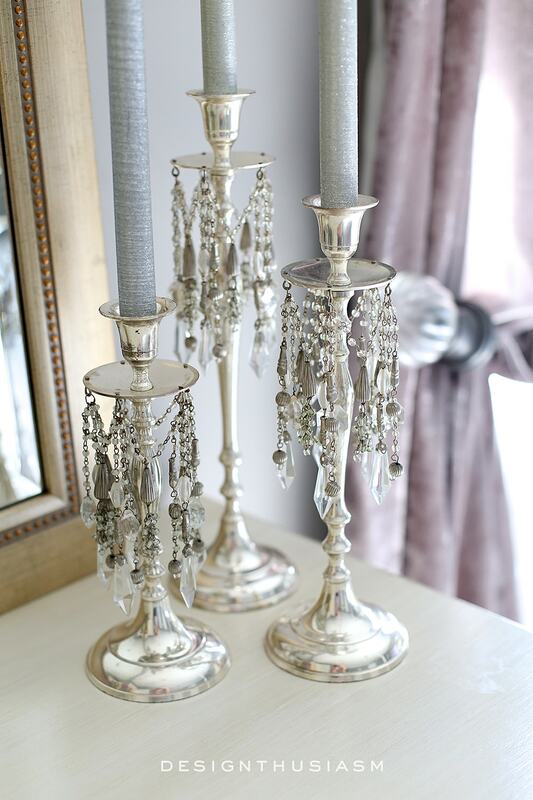 I love all the details, the pretty candles even the texture of the pear pictures frame..Perfect! The wall color is so soothing. Another winner! Thanks you, Elizabeth! This one was fun to do because it was a little different than my typical style, yet I think it still works with the rest of the house. So glad you appreciate all the details… 🙂 Thanks for stopping by!! Thanks, Denise! The room is actually a perfect representation of who my daughter is with the mix of menswear and frills. She’s both strong willed and driven, yet soft and feminine… 🙂 I think she does enjoy coming home from time to time. Your room sounds lovely with the touches of yellow included. Thank you, Denise! Actually, the photos are still there right under the header. I’ve updated a few of them and the category names are on top, but the design is still a work in progress and that might be revised. The entire site design was updated, mainly to upgrade the functionality, but the new design is also a bit more polished, I think. Are you reading on a computer or mobile? I’m definitely still having issues with the mobile design, so that might be affecting your experience. I do really appreciate the feedback, in any case. Please let me know if you are not seeing the category photos still. Thanks!! Gorgeous! Maybe the beautiful room awaiting her will bring her home more often? Stunning! Really a restful lovely room! 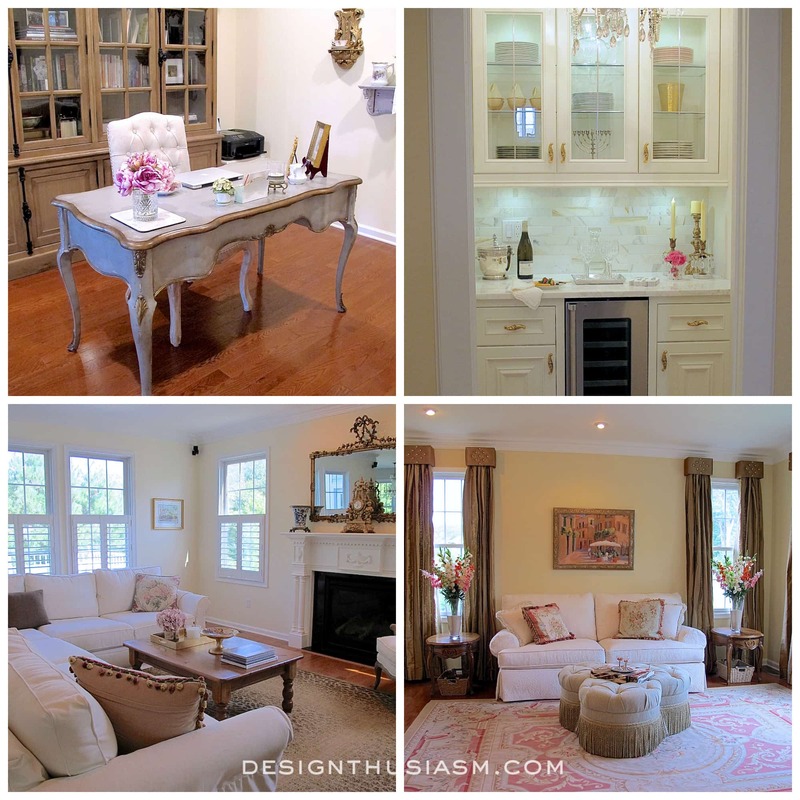 Lory, You did a wonderful job with this room! I sometimes find grey to be a cold color, but not in this case–everything together has a very cozy feel and I love that the room has a unisex look. As always, you knew just what elements would work best, and I’m crushing on that pop of just the right color lilac and those gorgeous crushed velvet drapes. I know your daughter has to feel very special that mom put in so much effort just for her. Thanks so much, Sandi! Sometimes I think our house is a hotel… lol!! But, of course, I love having guests… 🙂 Thanks for stopping by!! What a beautiful room. I love the lavender with the grays. Lory, I adore this color palette! Grey and lavender are my two favorite colors. I think your daughter will continue to enjoy coming home to this sophisticated room! Keep up the good work. I enjoy your blog very much. What a lovely and tranquil room to come home to- I wouldn’t be surprised if she moved back home! love the mix of textures and surfaces in such a subtle palette-Love the mirrored chest and I was going to ask where you found the drapes. looks great, not cold but cool and comfy. Love the combination/balance of frills & masculine materials. I am curious what color wall paint? Thanks so much, Beth! The paint is Benjamin Moore Winter Gates AC-30. 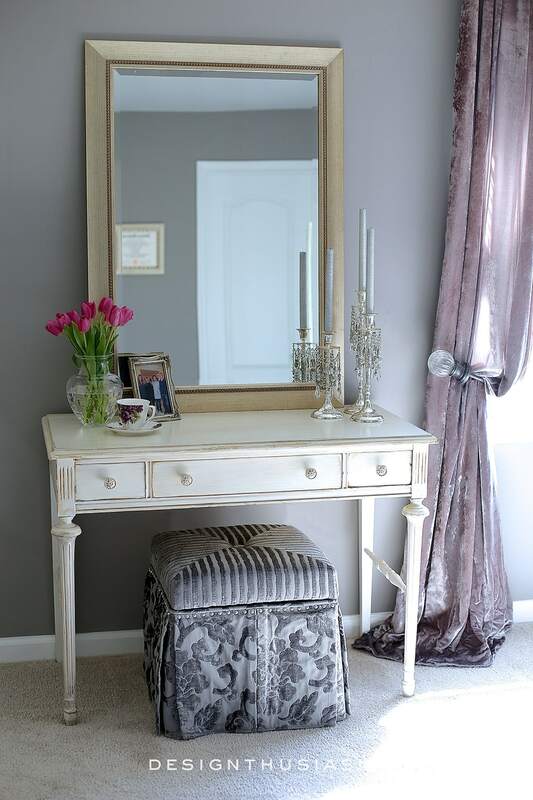 Your daughters bedroom makeover is both feminine and elegant,love the drapes and the chest of drawers. Love the gray walls in this bedroom. 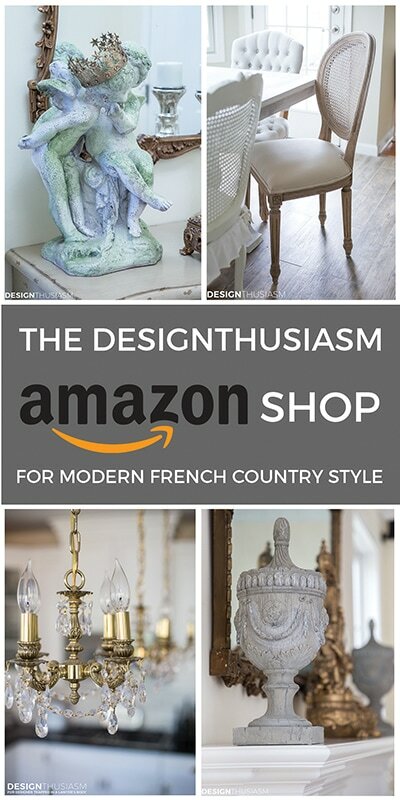 In the article it refers to the color as a “warm gray.” May I have the name of the color and who makes it, please? Thank you, Darline! Sure. The color is Benjamin Moore Winter Gates AC-30. Thanks for visiting! !